England’s two best TV writers, Richard Curtis and Ben Elton, crafted a small-screen classic. 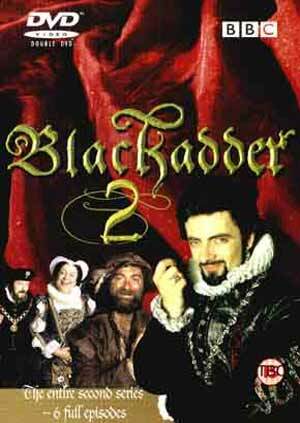 A 2004 British TV poll rated Blackadder the second-best sitcom of all time, and Empire magazine ranked it as the 20th-best TV show ever. The first six-episode season, set in 1485, was less funny and more slapsticky than the final three seasons. It portrayed Edmond Blackadder as an idiot, whereas in the latter trio (written by certified geniuses Ben Elton and Richard Curtis) he was clever, satiric, verbally sharp, and a tremendous pleasure to watch. Nonetheless, viewers who rated the four series at imdb.com disagree with me; 95% of them give Season One thumbs up, versus 92.6% for Season Two, 93% for Three and 90.8% for Four. Season Three won the 1988 Best Comedy Series BAFTA award and four other nominations, and Season Four repeated the feat and won another BAFTA for series star Rowan Atkinson, as well as snagging a Best Situation Comedy Series honor from Britain’s Royal Television Society. Atkinson was brilliant in the last three seasons, as was Tony Robinson as his moth-eaten servant Baldrick. Hugh Laurie was hilarious in the last two seasons, Miranda Richardson shined as a dippy Queen Elizabeth I in Season Two and Stephen Fry was outstanding in the final three series. The guest cast included many of Britain’s top thesps, including Robbie Coltrane, Peter Cook, Jim Broadbent, Colin Firth, Tim McInerny, Geoffrey Palmer, Brian Blessed, Frank Finlay, Miriam Margolyes, Patsy Byrne, Rik Mayall, and Warren Clarke. All seasons are available on Netflix and here on Netflix Instant, and most episodes, plus the 1988 and 2000 specials, can also be seen on YouTube. 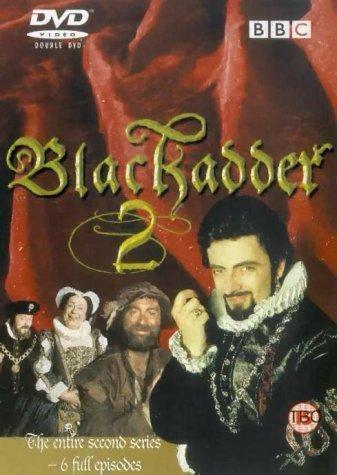 Blackadder is set in four distinct historical periods, and descendants of Blackadder and Baldrick (with the same names) appear in the final trio. Season One, set at the end of the War of the Roses, has Prince Edmund the Black Adder perpetually scheming to seize the throne from his father or brother. In Season Two, set in the Tudor Court of Elizabeth I, Blackadder is a courtier who seeks the nutsy, spoiled, whimsical and dangerous queen’s hand, in competition with her right-hand man Lord Melchett (Fry). The Queen is also advised by her demented former nanny “Nursie” (a priceless Patsy Byrne). Blackadder is aided in his plotting by clueless Lord Percy (McInerny) and dim-witted, dung-eating servant Baldrick (one of the funniest characters ever). 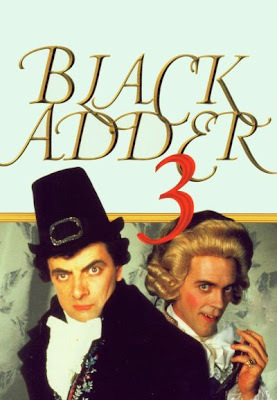 Season Three is set in the Regency period (18th and 19th Centuries, in the reign of George III) when Blackadder is a butler to the supremely idiotic Prince of Wales (a wonderfully over-the–top Hugh Laurie). The six episodes feature Dr. Samuel Johnson (Coltrane), William Pitt the Younger, the French Revolution, The Scarlet Pimpernel (McInerny), the Duke of Wellington (Fry) and a squirrel-hating transvestite highwayman. In one scene Baldrick asks, “Something wrong, Mr. B?” Blackadder replies, “Oh something’s always wrong, Balders. The fact that I’m not a millionaire aristocrat with the sexual capacity of a rutting rhino is a constant niggle.” Season Four, funny but slightly more serious in tone, has Captain Blackadder, Private Baldrick, and Lieutenant George (Laurie) in the trenches of World War I, while their fates are determined by misguided General Melchett (Fry), located in a chateau 35 miles behind the lines. If you have never seen the three final seasons of Blackadder, you have missed one of the great comic treats and should rectify that forthwith. Other series by Ben Elton (The Thin Blue Line ) and Richard Curtis (The Vicar of Dibley and films including Four Weddings and a Funeral, Notting Hill, and Love Actually) are also well worth watching. IDEAS / Bill Meacham : Free Will or Free Won't?